Complete range of PVC fittings used in all irrigation watering systems and fresh water piping networks. Complete range of Spears Brands Schedule 40 PVC fittings used in irrigation watering systems. Smooth interior walls result in lower pressure loss and higher volume than metal fittings. Excellent for use in repairing broken lines or adding additional lines. Simply cut section of broken pipe slightly longer than compressed Quick-Fix, apply glue to fittings and expand Quick-Fix to fill the gap. Rugged Hi-Impact PVC Sch 40 Type II construction. 1033kPa rated in all positions. Internal self-lubricating EPDM oʼring for long life and smooth movement. Used in PVC Pipe networks carrying water. * Do not use on gas, oil and compressed air. Repair coupling used in PVC Pipe Networks carrying water. Used to allow the addition of a tee branch in PVC Pipe Network carrying water. Excellent for use in repairing broken lines or adding additional lines. Simply cut section of broken pipe slightly longer than compressed Flo Span, apply glue to fitting and expand Flo Span to fill the gap. 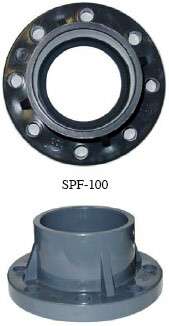 Designed for use for joining plastic piping systems, where frequent disassembly may be required. Suitability of application is at the discretion of the user. 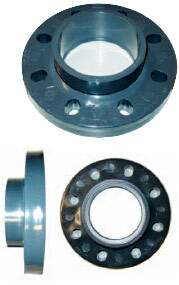 Designed for use in joining plastic piping systems where frequent disassembly may be required. Suitability of application is at the discretion of the user. Kwikcut is a Plastic Pipe and Hose Cutter designed to meet the needs of the professional. The rotating / rocking technique produces fast, easy cuts, together with being small and lightweight, saves hours of time and effort. 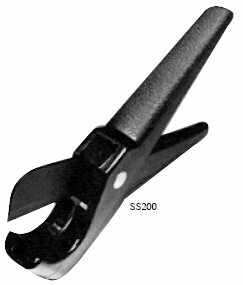 It is ideally suited to a limited working space, the cutter adapts easily where a conventional hacksaw cannot be used. Kwikcut produces no cutting residue, eliminating deburring and the possibility of contaminating the pipe. This clean, smooth cut allows quick and easy connections for a neat, professional installation. Replaceable high-carbon, Teflon coated steel blade. Blade closes into its own handle for safe carrying and handling.